A break from the COLD! So it seems we are getting a bit tired of all the cold weather! We are freezing up here while we impatiently await the beautiful summer days ahead! So lately the girls have had way too much energy. I seems like I have run out of ideas or just gotten lazy when it comes to entertaining them in our little house. So some friends of ours found this fun gymnastic gym that has open play everyday for an hour. We decided to get out of the house and give it a try. The girls had a ball! I think we could have stayed there all day and they wouldn't have gotten bored! 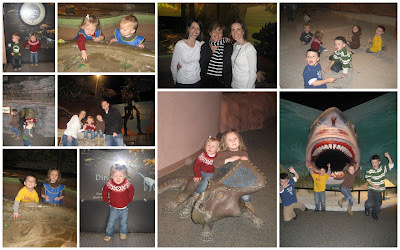 Here are some cute pics from the adventure. Audrey is such a dare devil! She would slide down and take a 3 foot drop into the foam cubes! Abby jumping in the pit! Abby's favorite thing was the rope swing. 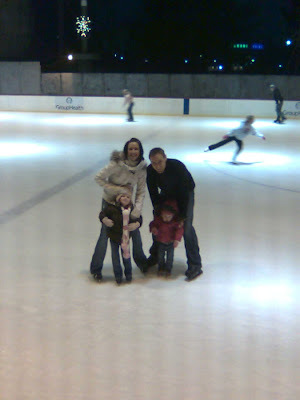 We headed out on the town the other night to take the girls Ice Skating. We went with our Friends Mandy and Colby. Abby and Tatum are the same age and love playing together. Sorry the pic are a little blurry...it was a phone camera. 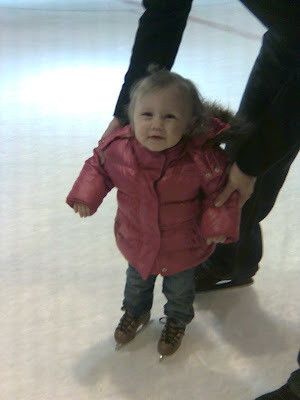 I had no idea they would have skates that would fit her. She loved every minute and kept saying more more! Thanks for the fun day! Just after New Years we headed up to a Cabin with the Marchbanks family. 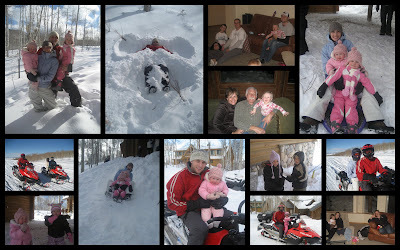 We had a blast sledding, snowmobiling, eating, playing games and watching the UofU play football!! Go Utes!! We got about a foot of snow while we were there. When we were getting ready to leave we got stuck in the drive way. We were lucky Levi had bought chains when he drove down from Spokane. We threw those on and got out slick as a whistle! As we were heading down the canyon we got a call from mom and dad, they said that Jen and Nate need some help. Well come to find out Nate was trying to turn a light on in the car and hit the sun roof button instead. Remember I told you we got a foot of snow. Well the whole foot of snow fell into the car with 4 sleeping boys, Nate and Jen. Needless to say they were all freezing! So we spent about 45mins in 9degrees trying to fix it. We finally got it to close(when the snow fell it it melted in the tracks and then froze instantly, which caused it not to close)and then the battery died. So we jumped the car and made it home safe and sound! It was quite and adventure and some great memories! This year for NYE we went to the Gonzaga vs Utah game with some of our friends from GU. We ate at Buca Di Beppo which was so yummy! Then headed to the game, which didn't turn out in our favor:(, but it was still fun! Then before heading back to get the kiddos we stopped by to see some of our friends in SLC. It was a great night with great company! 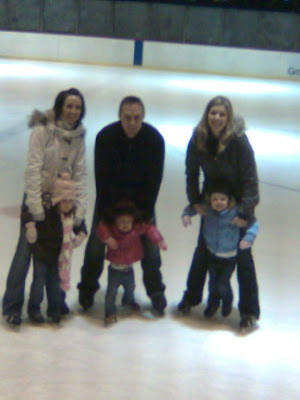 We are lucky that both our families live so close to each other. We are able to spend time at both of our houses on Christmas Morning. Thanks to our great Families for making our Christmas so great! We love you guys!! Not sure if you can get a better morning face then that one! The girls got bikes from Santa! They couldn't have been happier!